Forecast customer demand, weeks in advance, adjust pricing accordingly and efficiently procure the right capacities at each location. 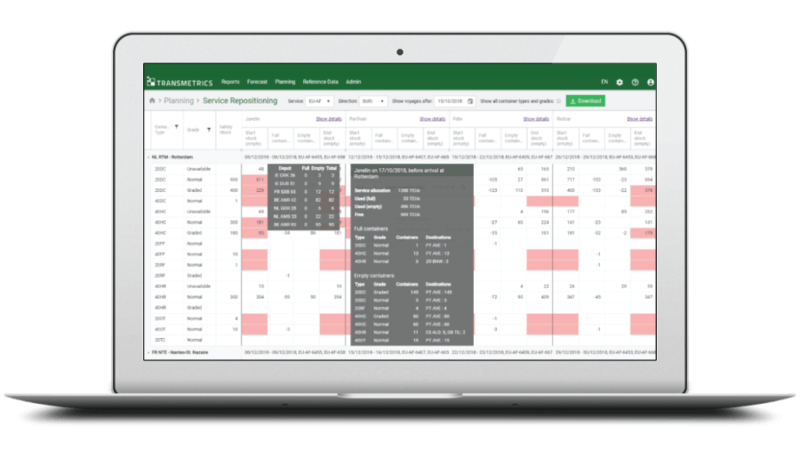 Transmetrics offers an automated forecasting tool specifically customized for Freight Forwarders. The AI-driven software forecasts customer demand per asset type and geographical area, weeks in advance. This enables forwarding companies to timely plan and procure the right capacities, and reserve the space needed, at the right locations. Booking this space in advance ensures maintaining high service levels and may also minimize procurement costs. Additionally, freight forwarders can deploy dynamic pricing strategies and generate additional revenues by adjusting pricing for irregular and spot market customers, depending on the expected demand. Transmetrics offers a complete end-to-end solution, which consists of two main product components. Each of them can be tailored to meet customer-specific requirements. Our proprietary Artificial Intelligence algorithms analyze your historical data, identify and improve data quality issues such as missing values, duplications, outliers, etc. This enables detailed historical reporting on operational efficiency. Transmetrics` software generates daily rolling AI-driven forecasts of upcoming shipment volumes on the most granular level. The forecasts are based on a mix of the already improved historical data and a set of external factors (e.g. seasonality, public holidays, weather, etc. ).